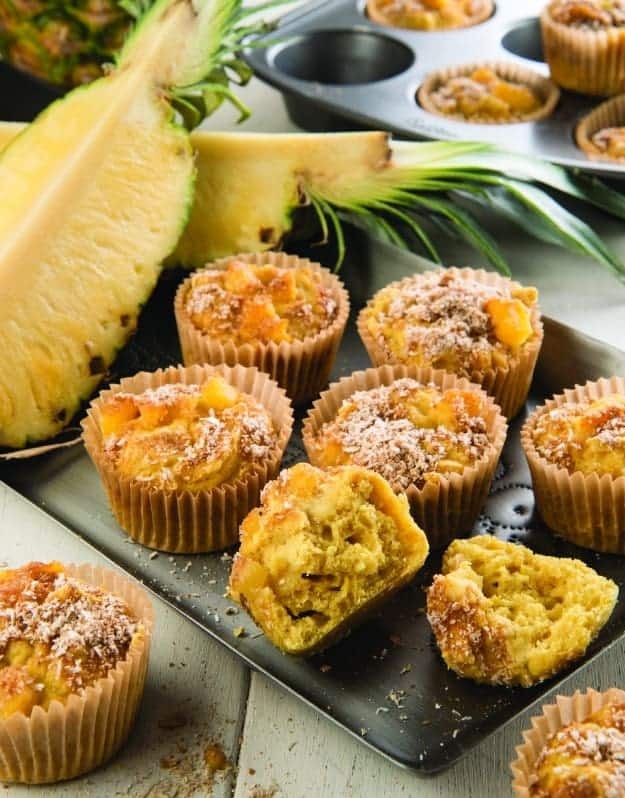 With so many of us wondering if Spring will ever truly arrive this year, today’s recipe for March Muffin Madness (MMM), gluten-free Tropical Pineapple Ginger Muffins, seems right on time. Most of us could use a little tropical escape right about now! Today’s recipe comes from the new cookbook, Sweet, Savory, and Free: Insanely Delicious Plant-Based Recipes without Any of the Top 8 Food Allergens. I’ll tell you more about this cookbook, which is one of the items in today’s daily giveaway, these muffins, the recipe creator and author of this cookbook, and we’ll revisit the overall grand prize giveaway as well. So much fun stuff for MMM! Debbie Adler is the author of the Plant Power Rising blog and the founder/owner of Sweet Debbie’s Organic Cupcakes. Her first book was Sweet Debbie’s Organic Treats: Allergy-Free & Vegan Recipes from the Famous Los Angeles Bakery. 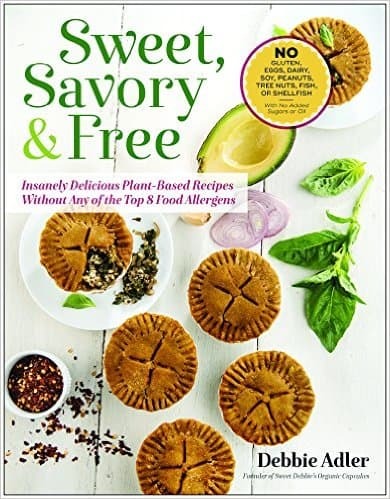 And as I said earlier, her newest cookbook is Sweet, Savory, and Free: Insanely Delicious Plant-Based Recipes without Any of the Top 8 Food Allergens. With her bakery’s location in L.A., you might be guessing that some of Debbie’s bakery customers are Hollywood celebrities and you’re right! You’ll find raves from several of them right on the covers of both her books. You can read my review of her earlier book here but let’s talk about her second cookbook for a minute. Sweet, Savory, & Free not only has mouth-watering desserts like Tiramisu Cupcakes, Candy Bar Cookies, Trail Mix Macaroons, and Chocolate Rosemary Donuts, but it also has colorful “want-now” savory recipes, such as Yam Gnocchi with Sriracha Pesto, Pot Pie Primavera, Creamy Minestrone, and Eggplant Parmezan Florentine. Oh, and bread—super appealing breads like Challah, “Rye” Bread Focaccia, Buttery Garlic Twists, and Kalamata Rustic Boule. There’s even more yumminess than those recipes but that’s a “little taste” for you! Whisk together the flour, baking powder, ginger powder, baking soda, guar gum, turmeric and salt in a large bowl. Make a well in the middle. Add the applesauce, coconut nectar, and stevia and stir to combine. Add the pureed pineapple and plant based milk, and stir until the liquid is absorbed and the batter is smooth. Fold in a ¼ cup pineapple chunks. Spoon the batter into the prepared muffin tin, dividing it evenly. Each cup should be about three-quarters full. Top the muffins with the remaining pineapple chunks. To make the streusel, whisk together the oats, coconut and coconut sugar in a small bowl. Top each muffin with the streusel, dividing it evenly. Transfer the muffin tin from the oven to a wire rack and let sit for 15 minutes before removing the muffins to cool completely. Keep muffins in an airtight container for up to 3 days, or wrap and freeze for up to 3 months. Reprinted with permission from Debbie Adler and BenBella Books. Take a look on Amazon (I recommend using the “Look Inside” feature on the left side of the book’s Amazon page) or read my notes above to learn more about Debbie’s latest cookbook. To enter the giveaway for Debbie’s cookbook or the NuStevia products, simply leave a comment on this post saying which you’d like to win. Originally published March 25, 2018; updated July 17, 2018.
thanks for sharing all these fun muffin recipes! Pineapple in a muffin sounds sooo good! Love pineapple! These look yummy. Love muffins of all varieties. Would love to win more fun things to bake with! Would prefer the Sweet, Savory, and Free cookbook please! Thank you! I’m starting to like ginger more and more and pineapple and ginger sound great. I don’t need to win any of these prizes today so if you pick my name, let someone else win! Yes! Tropical muffins for me and I’d love the stevia packets. These look great! A local GF bakery makes ginger scones with crystallized ginger inside them and they are amazing! I wonder if adding some in this recipe might work, too?! Can’t wait to try this recipe! I’d like the cookbook–I’m a savories lover, and also desserts that are not too sweet. Ginger and chipotle in chocolate are favorites! These look great! I can’t wait to make them! These muffins look awesome and it’s anotger one my egg free dairy free but free son can eat!!! How exciting!! 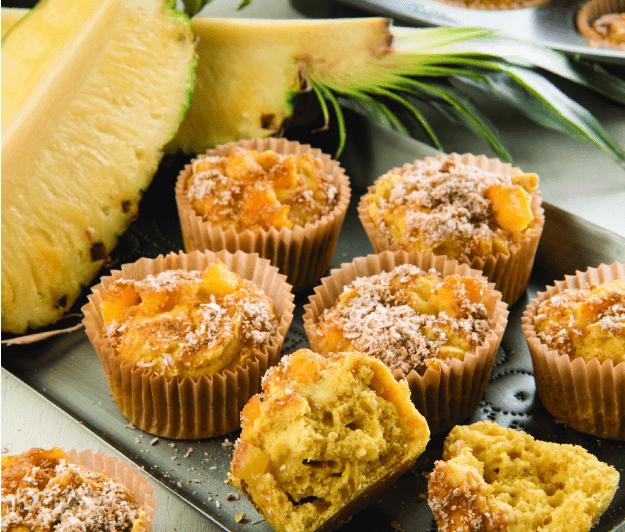 After this ridiculous winter we could all use a tropical muffin!! I’d love the allergy friendly cookbook!!! Pineapple, coconut and ginger? Yes please! Can’t wait to try this one. Sign me up for the cook book too please. Love stevia, but the cookbook looks like a fabulous resource. I’d love to win Sweet, Savory, and Free: Insanely Delicious Plant-Based Recipes without Any of the Top 8 Food Allergens. Very happy to learn about her blog and cookbooks with plant-powered perspective! Also, grateful for another chance at the Blendtec! Interesting flavor to try! I’d love the NuNaturals Stevia Gift Pack for dairy baking! These look and sound wonderful Debbie! The turmeric adds such a beautiful colour to the muffins. I would be so excited to win the NuNaturals Stevia prize! Not ingredients I would have ever put in a muffin but I bet it’s delicious! OMG! I would love the cookbook – it sounds amazing!! The muffins look wonderful also! So far I have only had to cut out gluten but I sometimes have to cook for times when there will be someone who has other allergies or has chosen to not eat things… and for those times this one would be great.